YOU don't need frog legs or escargot to celebrate Bastille Day (July 14) in delicious fashion. All you need is a touch of boeuf - also known as beef! 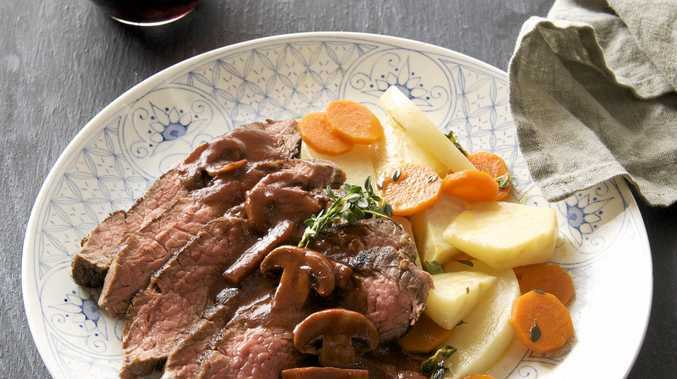 From sautéing, roasting, pan-frying, poaching and broiling, there are so many ways to create delicious and iconic French recipes with beef. Here's a classic French dish for you to try that would impress even Julia Child. Add vegetable oil to a large pot and heat. Add onion, carrot and garlic and sauté for 10 minutes, stirring occasionally. Add the beef mince and keep cooking on high heat until the meat turns brown. Add the red wine, tomato paste and the sprig of thyme and bring to a simmer. Cook for 30 minutes. Strain the sauce through a fine sieve in a clean pot, press well on the meat, and add the mushrooms to the sauce. Heat a fry pan with one tablespoon of oil and sauté the pancetta, drain on paper towel and add to the sauce. Cover the pan with a lid. Keep warm. Heat a pan with olive oil, add all the vegetables, season with salt and pepper and cook for 5 minutes, stirring occasionally. Add chicken stock and thyme. Lower the heat and braise the vegetables until they are tender. The chicken stock should have reduced by then. Add half of the butter to glaze the vegetables. Check the seasoning and keep warm. Season the flank steaks with salt and pepper. Heat a sauté pan over high heat, add the rest of the oil and butter. When the butter turns brown, add the steaks to the pan and sear for about 2 minutes on each side until brown. Use a large spoon to baste the meat during cooking. Note: Flank steak is best served medium rare. Remove the meat from the pan and set to rest on a baking tray in a warm place. Reheat the sauce and swirl with some extra butter. Slice the flank steaks across the grain and arrange a fan of slices on each plate. Arrange the root vegetables on a large plate with the meat on the side. Spoon the sauce around the meat and vegetables and serve immediately. Recipe by Philippe Mouchel, The Brasserie, VIC. For more beef inspiration and recipes, visit BetterOnBeef.com.au.